Commemorating my second Knit For Fun Retreat in Estes Park, Colorado, this simple cowl features alternating stockinette- and reverse stockinette-stitch welts. Although it appears as though half of the rounds are purled, they are all, in fact, knitted. The work is simply turned around every 12th round so that the “inside” alternated with the “outside” to create a reversible piece. The “wrap and turn” short-row technique is used to help hide the small holes that form when the knitting changes direction. 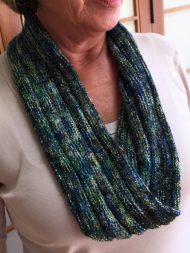 This satisfyingly easy pattern makes a great showcase for Vice Yarns Shameless (70% merino, 20% silk, 10% cashmere), shown here in a colorway designed exclusively for the 2016 Knit For Fun Retreat in Estes Park, Colorado. It would also look great in a solid, gradient, or any other type of hand-dyed yarn.